Chicago (October 11, 2017) — Design Museum Foundation, Playworld, Chicago Riverwalk, and the City of Chicago are pleased to announce the opening of a PlayCubes pop - up playground at the Chicago Riverwalk on October 11. The play space leverages public art to reunite communities, and is part of Extraordinary Playscapes, Design Museum Foundation’s nationally-traveling exhibition exploring the importance of play in childhood development, while showcasing how designers translate play objectives into innovative, extraordinary and outdoor play environments. A ribbon-cutting ceremony for PlayCubes with Commissioner David Reynolds from the Department of Fleet and Facility Management, Commissioner Mark Kelly from the Department of Cultural Affairs and Special Events, Commissioner Brian Bannon from the Chicago Public Library who is hosting the Extraordinary Playscapes exhibition at the Harold Washington Library, Missy Benson from Playworld, and Design Museum Foundation's Executive Director, Sam Aquillano will be held at the Chicago Riverwalk on Wednesday, October 11 at 12:00pm. Playworld, a leading commercial playground equipment manufacturer committed to saving outdoor unstructured play, demonstrates a shift in playground design with PlayCubes . The play equipment was originally introduced in the 1960s by Architect Richard Dattner, but was recently redesigned and reintroduced by Playworld through an exclusive partnership with Dattner. PlayCubes’ modular design and distinctive geometric shapes encourage exploratory, child directed, and open-ended play for children ages five and up. Kids can climb into the cubes from various angles, experience them at different levels, and discover new ways to get active and play. 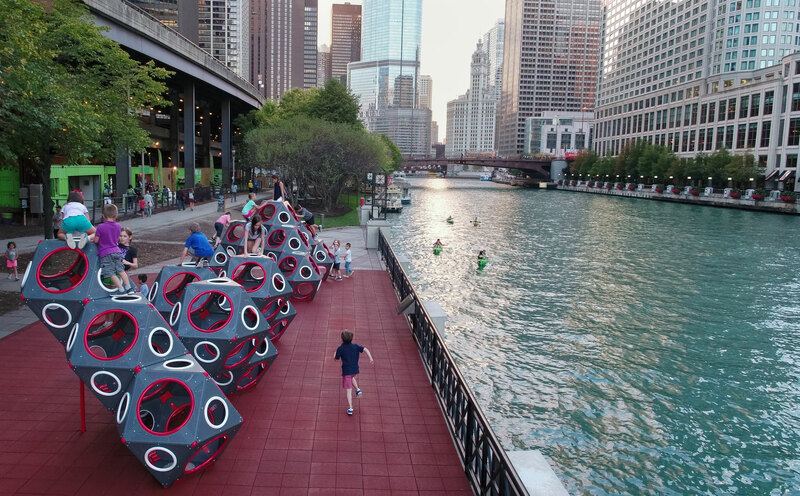 The pop-up play space along the Chicago Riverwalk is the first PlayCubes playground to feature the new industrial, metal version of the product — ideal for urban and high-traffic playgrounds where extreme durability is key. "Playworld was delighted to partner with Richard Dattner on reviving his original PlayCubes," said Missy Benson, Play & Design Specialist for Playworld. "The iconic sculptural play forms enhance any outdoor space and provide a play environment that is unique and supportive to child development. PlayCubes are demonstrating a new viability for play in urban areas. Big destination parks aren’t always the answer - due to the large space needed, which is a challenge especially in urban areas.” said Benson. “The Department of Fleet and Facility Management (2FM) is proud to mainain the Chicago Riverwalk,” 2FM Commissioner David Reynolds said. “The PlayCubes installation is a new destination on the Riverwalk which will help achieve Mayor Emanuel’s goal of allowing people to interact with natural resources in the heart of downtown. Extraordinary Playscapes and the new PlayCubes playground in Chicago were made possible through support from Playworld, the National Endowment for the Arts, Sappi Ideas That Matter, and BSA Space. * Editor’s note: High-resolution images are available for media upon request. Playworld is a division of PlayPower®, Inc. Playworld believes The World Needs Play®. Play is vital to everyone’s health and well-being. It’s something you are never too young or too old to enjoy. We develop playground environments where creativity is king, belly laughs are welcome and children make the rules. Playworld’s equipment and surfacing are designed to unleash the transformational power of play so bodies grow stronger, children play safely and imagination can take flight. For nearly 50 years, Playworld has created innovative, inclusive and meaningful outdoor play experiences for all ages and abilities. For more information visit playworld.com.